Day 10. Headaches. Dizziness. I can no longer remember how the sun looked like, nor how its warmth felt on my skin. I am constantly in this state of limbo, drifting between a state of half consciousness and blank outs. Gone were the days where I went out with friends, the days where I explored new places and the days where I actively exercised. It's still hard to believe how a curious attempt at the challenge has evolved into a single minded obsession to complete it, consuming so much a significant portion of my time and energy. I guess I'm a achievement addict like that. 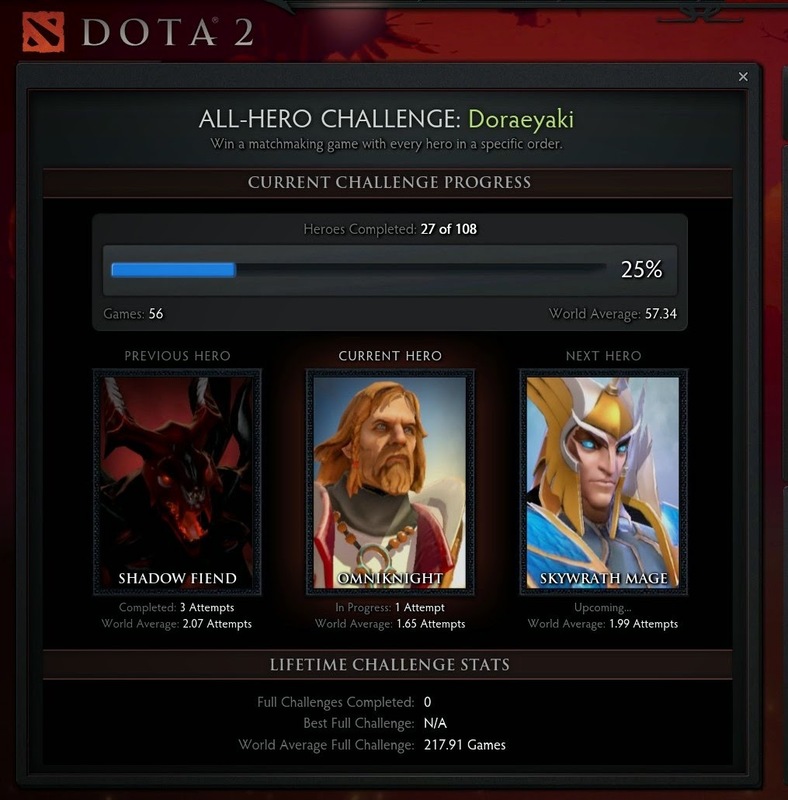 With 60 games so far and 28 out of 108 heroes completed (omg still got such a long way to go), I must say that for people like me who loves challenges, this has been the best tactic Steam has used so far to get me back into playing Dota. I must admit, there has been high and low moments, but the one thing that I've learned most from this challenge is that completing the challenge has nothing to do with how skillful you are, but rather the people that you're paired with/against in a game. I've been through hellish heroes and came out victorious (Earth Spirit was a big joke) while heroes that I've had an advantage on since the early game came up quite messed up from the match. It all depends on your team and opponents. One thing is certain though, Steam certainly has fucked up my life with such challenges like this.